In today’s market, collectors often ask themselves: should they buy fine art with the expectation that, in years to come, that price will perhaps double or even triple?We set out to answer that question with the help of Evan Beard, the National Art Services Executive with U.S. Trust, Bank of America Private Wealth Management. Headquartered in New York City, Beard and his team work closely with art collectors to help them in lending against their collection, designing philanthropic or estate planning strategies, negotiation at auction, and structuring and managing private foundations. As an authority on art-related investing and financing, Beard directs the end-to-end provision of services to clients in the art world.We asked Beard how collectors should think about art, how he views the opinions of other thought leaders on the topic, and where the next wave of growth in the art market is likely to stem from. Let’s say a client of yours sees fine art as an investment asset. Where does it fit into a client’s portfolio given its low to non-correlation with traditional investment assets? Is the return expectation similar for fine art as it is for other alternative assets in a client’s portfolio? Evan Beard: The client’s objective is key here. The empirical literature on the financial returns of art is extensive and tends to reveal that art delivers a less-than compelling risk-adjusted financial return, even after adjusting for diversification benefits. So if your objective is purely financial, then art is not a great investment (never mind the transaction costs, holding costs, tax implications, and liquidity constraints). Still, art’s total return goes far beyond the financial. Beyond a capital asset, art is an expressive and consumptive good. Owners derive important intrinsic benefits like cultural status, social capital, and aesthetic pleasure from owning a great work of art. These intrinsic benefits often lead to unique secondary financial benefits. So our advice is to buy art because it’s your passion and lifestyle, but do it with one eye on the financial implications. Is fine art considered an alternative asset at U.S. Trust – a category that would typically include private equity, hedge funds, real estate, and hard assets and infrastructure? EB: U.S. Trust offers a range of alternative and specialty investment classes from hedge funds, timber, farmland, and even oil fields, but we do not treat art as an investment class. Our U.S. Trust Art Services Group works closely with serious art collectors via lending against their collection, designing philanthropic or estate planning strategies, negotiating at auction, and structuring and managing private foundations, but we do not advise that clients buy art purely for investment purposes. Our view is that art does not live up to the standards of an asset class. Art is philosophy, psychology, symbolism, politics, beauty, connoisseurship, language, status, a social structure, an addiction, a lifestyle…so much more than an asset class. EB: The art fund industry has gone through several pupations. The British Rail Pension Fund invested in art as a diversification play. A spate of funds in the ’90s tried the hedge fund model of flipping privately sourced works. And more recently, we’ve seen a private equity model of collateralized art lending funds or closely held club deals. Most fund models have struggled due to one inescapable academic fact: the expected total return of art is both financial and intangible. Art funds cannot deliver intangible return and have thus only delivered financial returns that are simply too low on a risk adjusted basis. Every new art fund is still trying to replicate the most successful art fund in history which ironically was the first. In 1914 French financier, Andre Level and his Le Peau de L’ours investment club returned a stunning 400 percent to investors by purchasing early masterpieces by Picasso, Matisse, and Vlaminck from 1907 to 1914 during the perfect time and place that birthed its own epoch known as modernism. Good luck replicating that again. EB: The status-building impulse to buy art is as old as the Medicis. The Renaissance patronage system was largely status-signaling. Merchants commissioned works of art to prove their piety to a church viewed their profession as usurious and sinful. The pure investment impulse to collect is indeed a modern phenomenon, but I’ve still never met a serious collector who buys art as a way to prove he or she can throw money at something that will never pay a dividend. Sure, there are trophy hunters building cultural capital…not unlike the early 20th century industrialists who bought European art to signal cultural refinement. I’ve yet to see a work of art that sold for tens of millions of dollars not accepted by a large swath of the academic and art critical community as historically important or influential. I agree with Landau insofar that based on our own surveys at U.S. Trust, younger collectors certainly have rose-colored glasses on when it comes to investing in contemporary art. Many have unreasonably high expectations of future financial return. At U.S. Trust, we try and manage expectations and create opportunities for our art collecting clients. For instance, we help clients unlock capital from their collections to buy real estate, invest in their business, pay estate taxes, or even buy more art…all while keeping the art on their walls. EB: The art lending industry has expanded rapidly over the last ten years. We estimate that the industry now stands at ~$15-17 billion in loans outstanding. They certainly are not solely in the realm of the billionaire collector. At U.S. Trust we manage the largest art lending book in the world. Our loans tend to be 1 to 3 year term loans that can easily roll year to year. We can do the $500 million loan for a hedge fund or private equity fund manager looking to unlock capital to invest in his or her fund. But we also do the $5 million art loan to a multi-generation family looking to pay estate taxes. How do you help clients liquidate art in their portfolio? As an advisor, are you active in the secondary market? Can you help a client monetize his/her art assets if the need for liquidity suddenly arises? EB: Our U.S. Trust Art Services Group maintains very strong relationships with the auction houses. We work closely with our clients on the sell-side. We help clients negotiate auction consignments, manage estate settlements, design de-accession plans, and conduct philanthropic gifting strategies. Where is the next wave of growth in the art market likely to come from? EB: The evolutionary direction of culture and taste is anyone’s guess. We do know that younger collectors are more commercially driven, philanthropic, socially engaged, willing to use their art as loan collateral, sell works of art as they collect, and view their art as a capital asset. This will require wealth management firms and private banks to raise their game in how they advise and engage their clients around tangible assets like art. Do you have any words of advice for the new art collector looking to build a collection, but also invest for the future? EB: Collect what you love. Don’t buy art purely as an investment. When your collection gets serious, work with a private bank that understands the complex dynamics of your passion. 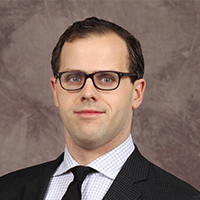 Evan Beard is the National Art Services Executive with U.S. Trust, Bank of America Private Wealth Management. Headquartered in New York City, Evan leads the bank’s outreach to private and institutional art collectors, investors and artists nationwide. He works with a team of specialists who provide a suite of tailored offerings to a select group of families, auction houses, museums, endowments and foundations. An authority on art-related investing and financing, Evan directs the end-to-end provision of services to clients in the art world, including trust structuring and estate planning services, art-secured lending, financing and philanthropic services. Prior to joining U.S. Trust, Evan was the U.S. Art and Finance leader for Deloitte Consulting. Previously, Evan served as a U.S. Naval Intelligence Officer in Washington, D.C., and the Middle East, advising the Pentagon, NATO and Joint Staff on bilateral intelligence-sharing agreements with Middle East allies.